That’s right; Today is the maiden edition of ProConnect! As you probably know by now. Single in Gidi and Mona Bellucci Events present upwardly mobile professionals with an exciting opportunity to mix, mingle, and rediscover their social fire at ‘ProConnect 1.0’. ProConnect is a networking event, targeted at single professionals in metropolitan cities such as Lagos who are looking to meet new people, expand their social circles, and possibly find ‘the one’, in addition to making friends. The event will feature exciting and stimulating interactive sessions, an art exhibition by Tokunbo ‘Olatoxic’, music by Femi Leye and Olujazz, a two course dinner, and a drink bar by Martini all for the price of N10,000 (ten thousand naira ONLY). 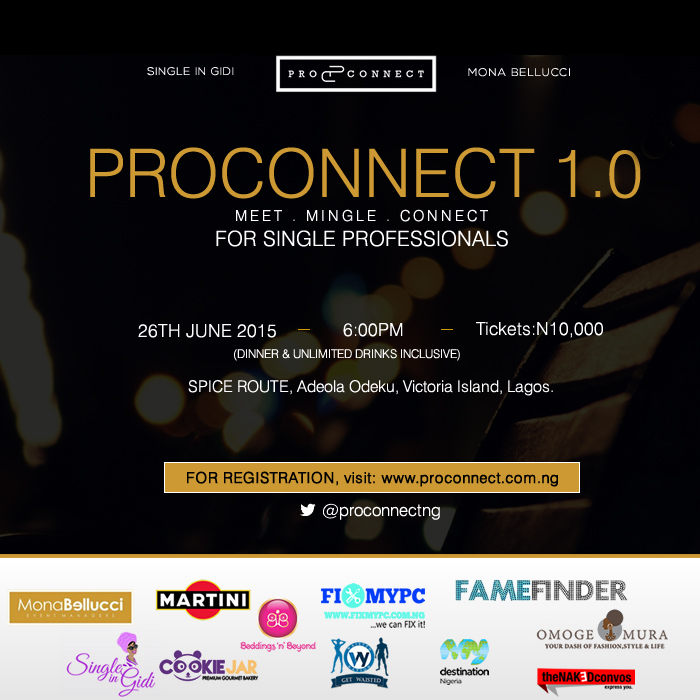 ProConnect 1.0 will be taking place at 6PM on the 26th of June (that’s TODAY incase you missed that), at Spice Route, Victoria Island, Lagos, and is proudly sponsored by Martini, Beddings N Beyond, FixMyPc, Cookie Jar and WaistedNation. Want to be part of this amazing event? To sign up, please visit www.proconnect.com.ng. We will be accepting registrations and payments online until 4pm today, after which, potential participants would have to verify and pay at the door. If you choose to be verified and pay at the door, you will be charged 12,000 and we will only be accepting card payments.